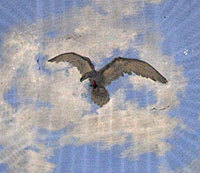 As the poet says, man rises on the stepping stones of his dead self to higher things. At the moment I’m sloughing dead selves faster than a snake sheds its skin! So I have devised a system to keep track of where I am at any given time. I count off cables with a 7-barred gate and at regular intervals – at the end of every second diamond, say – I check the total number of rows against the number of completed diamonds (so ten 18-row diamonds equals 180 rows, equals 25 cables plus 5 rows). That way, I have a foolproof method of ensuring that I never get too far out of sync. Foolproof, did I say? Alas the day. You see, I have one final, fatal problem to overcome, which is a tendency for my mind to wander at crucial times – or even for several days. 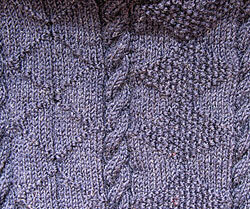 So it was, gentle reader, that I made a crucial error – somehow I skipped a couple of rows, eliding two diamonds. I knew something was wrong at the time, I could see it wasn’t right; but because of my aforementioned eyesight problems I couldn’t tell what it was. (And, since Margaret was off big-game hunting in France, I couldn’t just ask anyone.) So I gave a mental shrug and carried on, slightly puzzled, but not even certain anything was wrong. Until I got to the second diamond and discovered that the numbers didn’t add up; I was two rows short. You know that sensation where you go very hot and then very cold in rapid succession? If you imagine a Star Wars robot with blue lightning flickering over the casing just before it falls over, stunned, that was pretty much me. So some 3 inches has had to come out, about 8 hours work. Sigh. Luckily, knitting for me is always more about process than results. I do it because I enjoy it – discovering completed ganseys dropping off the production line every few months is a sort of unexpected bonus. So I’m taking a few days off to recoup my energy, and then it’ll be as it if never happened. 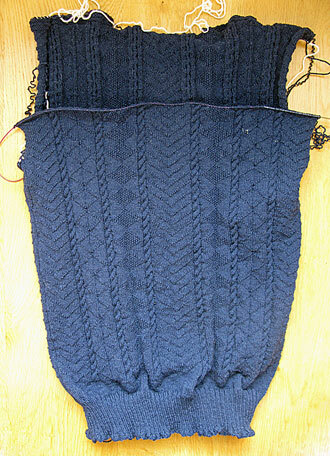 And at least I have completed the back (successfully – the numbers add up! ), so you can get an idea of how the whole thing will look when it’s done. While Margaret’s been away I’ve just got my head down and put in some 5-7 hours a day on the novel. I’ve almost finished the first draft – the 127th, really, if you count the number of times I’ve gone over it – there’s a just the final tweaking and polishing to go. It’s a historical fantasy, basically the Wars of the Roses with magic, and is also a supernatural murder mystery (who murdered the demon and why?). It clocks in at 70,000 words and I’m rather pleased with it, while accepting that I probably haven’t a hope of seeing it in print. I’ve been in a ciabatta kind of mood, experimenting with rolls and loaves. I think they might have come out better if the oven hadn’t gone out halfway through! Gordon, you are very stoical! It would have ruined my week! And how do you pull it all out without dropping loads of stitches? Frustration to the nth degree losing those rows! My question is where do they go when they dont’get knit – stitch limbo? You have infinitely more patience than I do but then I’ve got knitting ADD – four project on the go. Does that say anything about personality? Wow, can I relate! I’ve picked up my sort-of-a-gansey again, finished the left sleeve, and went through the 90 minute ordeal of picking up the stitches for the right sleeve. 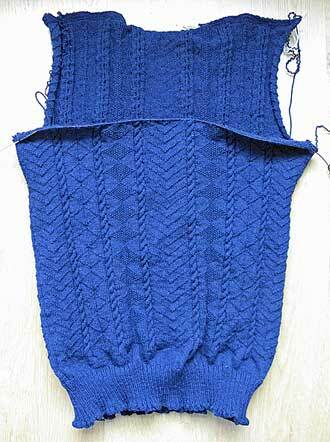 I started knitting, and in the second row, I discovered that I skipped an important set-up row for the pattern. I was in high dudgeon for hours, and at one point was thinking about chucking the whole thing into the cat’s litter box. I think that I’m back on track, but next time (when I go for an almost-a-gansey instead of a sort-of-a-gansey) I WILL keep better notes, and I WILL pay attention. I hope. Don’t worry, we’ve all done it (in my case, many times). The temptation to treat the gansey like an unsatisfactory supermarket trolley and just quietly ditch it and get another is strong, I must admit. And going back to it is like giving a relationship a second chance – can you ever recapture the innocent rapture after you’ve transgressed? I sure wish I had thought of Margaret’s thread technique last year when I had to unknit 8 inches of the Deep Ocean gansey – it took me nearly as long to get those stitches back on the needle as it took to re-knit! You need the reverse ‘pensieve’ from Harry Potter to retrieve your memories. Funnily enough I’ve been thinking about memories a lot recently. Strange how the painful ones – social death, humiliation, accidentally destroying someone’s life, being caught by the LAPD with that girl who was really a – well, you get the idea – are the ones that stay with you. Whereas the happy ones – all three of them – vanish like the snows of yesteryear. More proof if any were needed that God has a sense of humour, just not necessarily a nice one! I am amused to know how much I missed this blog. I knew it wouldn’t be updated, but I kept checking it. It’s good to see all of you again! I’m looking forward to seeing more of this next novel! And to seeing the gansey’s continued growth. 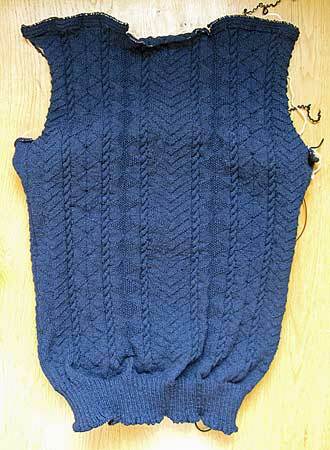 Many people use lifelines when they’re knitting complex things like ganseys or lace shawls. I don’t tend to, because I’m cocky like that, but I recommend it to most of the other knitters I know. I’m glad you got the offending part pulled out safely! My technique relies on not making mistakes in the first place, and so long as I’m careful I don’t have any probl- oh, wait. I had tried the ‘life line’ for a lace beaded scarf project that entailed 5 feet of pre-strung beads, flimsy rayon thread, and yarn overs alternate stitches. I finally abandoned the technique because of the time frame I was in and chose Gordon’s ‘no mistakes’ method, but this was after I gained some experience with the slippery thread. Life lines are good, but time consuming. Lynne – that’s exactly why I don’t use lifelines. They take so long to set up and they’re so fiddly and, ultimately, they’re annoying. I just … make no mistakes. (Riiiiight.) Really, I’m just very very good at picking things out and at finding my mistakes early enough to not have much to pick out. And Gordon – I have a confession. I’ve been running around a lot and haven’t even started the Welsh Christmas story. I’ll read it this weekend and get back to you. No, don’t worry – as I said, you’re probably best leaving it to winter, anyway, to get the atmosphere – it’s not really an August book! Ah, Lee – I still have deep affection for him. As I see it we both fought in the war against a common enemy, and even though since then our paths have diverged and we’re now on opposite sides, yet I honour our old friendship and like to think that if I ever had him in my sights I wouldn’t pull the trigger. I keep hoping he’ll defect and join me on this side of the wall! Margaret has asked me to point out that the needle she used was a standard circular 2.25mm knitting needle to insert into the stitches, not a needle and thread – apologies for the lax terminology!